Bev Ditsie and Zanele Muholi both won Feathers of the Year. Ditsie in 2012 and Muholi in 2013. They are both South African lesbian icons. Most influential in different ways. Some of the commonalities between them is their sexuality and being born in South Africa during the ’70s. Bev from Soweto and Zanele in Umlazi township. Bev. is an activist, filmmaker, musician, actor, television producer and director. She was at the forefront of the LGBT rights in South Africa and beyond through the whole of the 1990s. She was instrumental in founding the gay rights organisation GLOW, creating and contributing to public conversations regarding gay rights, women’s rights, human rights, influencing policy and raising awareness, and was one of the organisers of South Africa’s first Gay Pride March. She is also the first gay African woman to address the United Nations. She has been working in the television industry since the age of 10 as an actor and voice over artist. In the past 18 years Bev has worked as a Director, Content Director and Series Director on music videos, variety, education shows, documentaries, and reality television shows such as Big Brother Africa, Master Chef SA, All You Need Is Love and Survivor South Africa seasons to date. Zanele Muholi is a visual activist and was born in Umlazi, Durban, and lives in Johannesburg. Muholi co-founded the Forum for Empowerment of Women (FEW) in 2002. 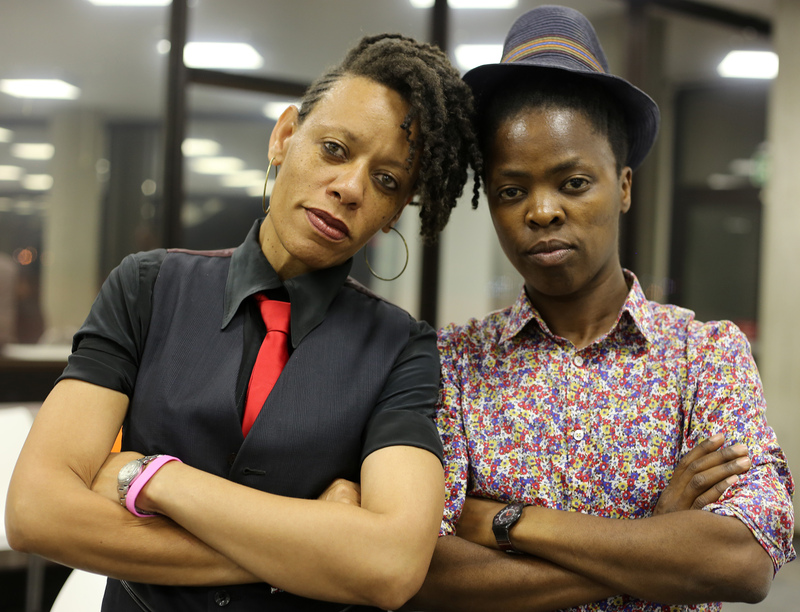 In 2009, founded Inkanyiso (www.inkanyiso.org) queer & visual (activists) media. Muholi mission is to re-write a black queer and trans visual history of South Africa for the world to know of our resistance and existence at the height of hate crimes in SA and beyond. Muholi continues to train and co-facilitates photography workshops to young women in the townships. Current project: 2014 PhotoXP, a collaboration with three women at Aurora Girls High School, Soweto. She studied Advanced photography at the Market Photo Workshop in Newtown, Johannesburg. In 2007 – 2009 studied MFA: Documentary Media at Ryerson University, Toronto. Muholi is an Honorary Professor of the University of the Arts/Hochschule für Künste Bremen. Her Faces and Phases series has shown on Documenta 13; the South African Pavilion at the 55th Venice Biennale, Imaginary Fact: South African art and the archive; and the 29th São Paulo Biennale; a book of the series published by Steidl Press will be launched in Ulm, Germany in Sept. 2014. This entry was posted in Acceptance, Awards, Bev Ditsie, Black Lesbian Icons in South Africa, Know Your SA Queer History, Knowledge, Language, Learning, Lesbian Professionals, Life, Life lived, Life Stories, Living, Living by example, Love, Love is a human right, Love is Queer, Loved, Lovely words, Media works, Memories, Moments in herstory, Moments in our history, My life in short, Our lives in the picture, Owning our bodies, Participation, Perception, photographers, Photographs, Photography, Power of the Arts, Power of the Voice, Privilege, Proud lesbian, Proud to be, Publications, question of history., Reason, ReClaim Your Activism, Recognition, recognized, Records and histories, Relationships, Respect, Respect & Recognition from our community, Respected person, SA Lesbian Feathers of the Year, Self love, Self portraits, Self recognition, Self-worth, Sexual orientation, Sexual Politics education in South Africa, Sexuality, Sexuality in South Africa, Sharing knowledge, Sharing thoughts, Social responsibility, South African politics, South African struggle, South African townships, Statement, Supporting each other, Survived, Textualizing Our Own Lives, Together we can, Togetherness, Townships, Trust, videographers, Visibility, Vision, Visual activism, Visual activism is a language, Visual Activist, Visual democracy, Visual historical initiative, Visual history, Visual history is a Right not a luxury, Visual Language, Visual narratives, Visual Power, Visual sense, Visual Voices, We Are You, We Care, We Love Photography, We Still Can with/out Resources, We were (t)here, When Love is a Human Right. Bookmark the permalink.